Adhesive interactions between disseminating tumor cells and the microvasculature (endothelial cells, leukocytes, platelets, extracellular matrix components, etc.) represent an essential molecular event in the metastatic process. 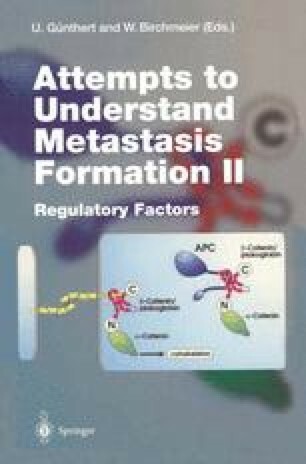 As in the case of other metastatic determinants such as angiogenesis, proteolysis, motility and invasion, the adhesive interactions also are mediated by distinct groups of molecules, termed adhesion receptors, which are represented by four major families, i.e., integrins, the immunoglobulin supergene family, cadherins, and selectins. Many other molecules such as cell surface carbohydrates and lectins, proteoglycans, and some growth factors also possess adhesive functions under special circumstances. The relationship between adhesion and metastasis is simply exemplified by an in vitro adhesion assay utilizing tumor cells of differential metastatic potential. As illustrated in Fig. 1, B16 F10 murine melanoma cells (a high metastatic subline) demonstrated a more rapid and quantitatively greater adhesion to microvascular endothelium that F1 cells (a low metastatic subline), thus suggesting a positive correlation between the metastatic ability and adhesive ability of tumor cells. The literature is replete with examples demonstrating a cause-and-effect relationship between adhesion molecules and tumor cell metastasis. Quite convincing data have been presented for three adhesion molecules, i.e., α5β1 integrin, E-cadherin and C-CAM, which possess metastasis-suppresive functions.